Want to capture the world’s best foliage this fall? We’ve rounded up 8 of the most magical autumn holiday destinations to visit while the leaves are still falling this 2017. Whether you're relishing flamboyant reds and yellows in Japan or capturing the colours of copper beech trees in some of Europe's lush woodlands, we've highlighted some of the best places to go on holiday in October and November if you're all about autmn 2017. In Japan, the leaf-viewing tradition known as koyo, is only second in popularity to the spring cherry blossoms season. The city of Kyoto stands out remarkably for its old wooden temple pagodas, brilliantly framed by fiery autumn leaves. Visit Japan in November, when the koyo or autumn season is in full swing and makes for a memorable experience. Fiery autumn shades paint the landscape, starting in the Hokkaido region in September and moving south across the country until December - which is considered the best time to visit. Hidden within the bustling city of Berlin are many wonderful parks and gardens, meaning you're never too far from nature. Autumn is known as Herbst here and is best experienced in Tiergarten - the city’s largest park was once only exclusive to royals, but remains today as a favourite hangout spot for the public during autumn months. The city's pathways, which spread across 23km, are great for walking, cycling and running, and in November they're wrapped in pretty autumn hues of red, yellow and amber. The Grunewald forest, a short drive from the city, is another favourite to witness the stunning foliage away from the hustle and bustle. Pfaueninsel is a small island good for day trips, and you might even cast your eye on some colourful peacocks. With wonderfully warm temperatures of 20°C and above in October, Lisbon provides the ideal city break to watch the sun shine and autumn leaves fall. Head to the hilltop of São Jorge Castle, which overlooks the city of Lisbon and the Tagus River. The best leafy neighbourhoods to admire the fall colours are Belém, Alfama and Mouraria neighbourhoods (including Lisbon's castle). Soak in the architecture and potter around pretty cobblestone streets in the downtown Chiado and Baixa neighbourhoods - plus, you've got wonderful beaches just a short drive away from the buzzing city squares too. In the evening, discover the chic bars and clubs of boho Bairro Alto. It’s the la rentrée season (France's fourth season) in most of the country, making it one of the best places to go on holiday in September and October if you want fewer crowds and gorgeous foliage. You'll find dozens of parks and gardens dotted across many of France's cities, in Paris, Bois de Boulogne and the Parc des Buttes-Chaumont are picture-perfect when it comes to natural beauty this time of year - so don't forget your camera. Loire Valley, Chambord and Clos-Lucé in Amboise are all well-known for their warm views too. The Douro valley of Portugal is a UNESCO World Heritage site renowned for its incredible natural beauty, meandering rivers and the birthplace of fine wine port. If you haven't been to this beautiful region before, there's even more reason to visit during the Autumn months, when the rolling hills and vine-crept landscape assume a molten golden hue. Admire the twisting Duoro River fringed by grapevines, while sipping on a glass of the region's finest. Nature Park Medvednica is only a 30-minute drive from Zagreb, the bustling capital of Croatia, and in October, its hilltop location reflects a colourful bloom. The city boasts fantastic sights, restaurants, bars, history and entertainment, making it a great city break destination if you want a mixture of old and new. Once you've seen all there is to see in Medvednica, drive to Risnjak National Park thick with lush forests and wildlife. Active travellers will be in their element, with plenty of climbs to hike on foot - the highest peak standing proudly at 1528m! 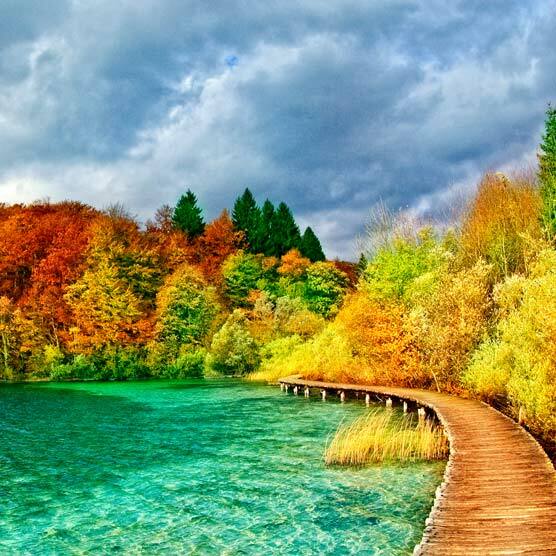 You could also choose to witness autumn’s glory at Krka National Park, and the larger Plitvice National Park. Pictorial villages and rolling vineyards bring a touch of resplendent colour to Italy’s alluring countryside. A short drive away from Florence, Val d’Orcia region is where visitors can watch grapes being plucked from golden vines in September through to October. This is also the best place to sample local pecorino cheese - a dream for dairy lovers. Autumn is the season of white truffle and wines in Italy, in the northwest region of Piedmont, you'll find white truffle fairs and markets hosted from early October-November with gastronomic stands and entertainment in a great location. Slovenia is just as beautiful all-year-round as it is during the Autumn months. The forests are full of Malvazija, Jakot and Rebula vines and leaves in a million brilliant colours. Don’t miss the popular Alpe Adria trail which is divided into 5 awe-inspiring segments, this one passes through the Triglav National Park (the only one in Slovenia), where you can soak up sights of emerald-green rivers, quaint villages and mountainous scenery. The Goriška region, a fabulous winemaking territory, also invites with its orange-laden bushes and colourful vineyards.